A report from Life Private Hospital group confirmed there has been no confirmed cases of Ebola in South Africa after a man was initially thought to have died of Ebola recently, proved not to be the case at all and the country is a very low risk area. South Africa has implemented all possible means to avoid the virus from entering the country.and contrary to the incredibly false and damaging reporting worldwide, it is safe to travel to South Africa. Geographical knowledge of the continent of Africa must be fully understood in context to the this virus. 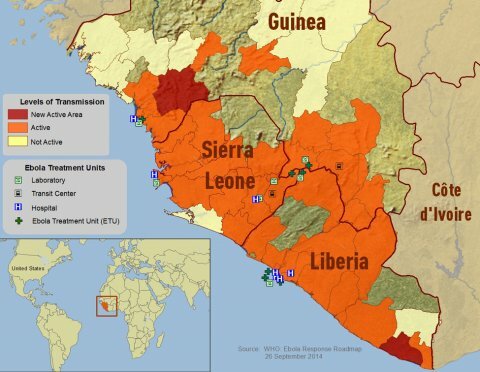 The countries of Liberia and Sierra Leone, God Bless their people, are the hardest hit with the virus with certain other West Africa countries under threat. 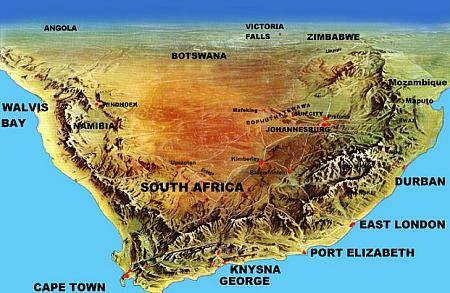 South Africa is a country within Africa at the furthermost extremes in the southern parts of the continent and between 6000km to 8000km or 4000 to 6000 Miles away from the main infected regions of the continent. This can be likened to double the distance from New York and LA. This is South Africa, come and enjoy the future with us. 2014 National Election, My vote went to the political party which had education heading their list of priorities and the largest portion of expenditure devoted to Education. On multiple occasions clients have said to me whilst on tour, "Andrew, you live in Gods own country", No better accolade. Visit this amazing country, be part and be positive for this beautiful country. Through Education Lies a Great Future. Effective 1 October 2014, South African Authorities require that all children, under the age of 18, traveling with adults to / from South Africa, be in possession of their original unabridged birth certificate. Children traveling with only one parent or other person or where one parent or both parents are deceased, must be in possession of an affidavit from the remaining parent/s or guardian, permitting the child to travel. Please consider this new regulation well in advance, especially in regard to your children and moreover if you travel with a minor such as a niece , nephew or friend. Eateries In Cape Town Where Locals and History meet. Visitors to South Africa largely express their desire to visit and experience places where the local people spend time, away from the so-called tourist routes and traps. In Cape Town there is no better place to start this cultural experience than dining out at establishments which have existed and prospered with regular local patronage for many years and in some cases for over a hundred years. Capetonians are social people with multicultural backgrounds spawned from the common nickname, “Tavern of the Seas”, as Cape Town was where sick, weary and weather- beaten sailors and travellers from around the world, after months at sea would stop, relax and refresh. Relaxing was definitely taken to heart and still exists amongst Capetonians and the list below will guide you to exactly where you will currently find casual comfort and scrumptious food, offering superb value as it was found at some of the establishments, over 150 years ago. Perseverance Tavern, City est.1808, wine and malt license issued 1836. Commonly known as “Percies”. Hearty pub menu. Forrester’s Arms, Newlands est.1852 became a Tavern and Inn 1881. Affectionately known by all as “Forries”. Indoor Fire place, outdoor beer-garden, Carvery, a’la carte and Pizza. Seaforth Restaurant, Simons Town est.1950 as a tearoom turned restaurant and renovated in 1996 after a major fire. Views and mixed choice menu. Hussar Grill, Rondebosch, est. .1964, Great Steaks. La Perla, Sea Point, est.1969, a promenade institution. Nelson’s Eye, City, est. 1960’s, steaks as legendary as its' neighbour Mount Nelson hotel. Brad’s Grill ,Harfield Village, est.1978, Pepper sauce fillet at its best, Legend status. Anatoli, Green Point, est.1987, Turkish, meze and Lamb, perfect for something a little different. Cattle Baron Chain, est.1987, focus on Tableview restaurant, 400gram rump & sauce, absolute winner. Dias Tavern, City,est.1988, a Cape Town institution, Peri-Peri Chicken and more, Legend status. Chapmans Peak Hotel restaurant, Hout Bay,est.1988, best know calamari in town. Bayside Cafe, Tableview, est.1989, ex Camps Bay, renowned spareribs and complementary veg. Kalkys in Kalk Bay Harbour, est.1996, the best fish ’n chips, informal, unique atmosphere. Olympia Cafe & Deli, Kalk Bay, est.1998, Sunday favourite. Fat Cactus, Mowbray, est.1998, Mexican, best chilli-poppers in Cape Town. If you are a local Capetownian reading this please add any other restaurants which come to mind which are not mentioned which have over a decade of trade behind their names. You are welcome to add this info in the comments. Fruit on display at the V&A Hotel in Cape Town. On numerous occasions I have heard the delight in the tone of many foreign tourists’ voices, making their way from the hotel to their tour vehicle, describing their breakfasts in South Africa with great satisfaction and pleasure. South African farmers often find themselves receiving bad press but they can truly stand proud when tourists find the fruit available for breakfast pleasantly presented, clean, sweet and fresh to eat. Most tourists find it hard to believe South Africa produces quality fruit and often find the parity of their respective fruits they eat at home, neither comparable to South African home grown fruit nor compared to the selection found in their respective countries. Recent clients of Indian origin based in the USA reminded me and inspired me to write this blog as they expressed their pleasure of enjoying the fruit on offer at the Victoria & Alfred Hotel in Cape Town. The South African fruit sector is one of the leading suppliers to the fruit markets of the world and this reputation is well deserved. Fruit South Africa; is an organisation charged with promoting and developing South African fruit on the international fruit scene. One of its many tasks has been to establish a fully South African ethical and audit process which is in line with international standards, is aligned to South African law, is internationally recognised and has the benefit of promoting ONE standard and ONE audit. This replaces the numerous standards and audits with which producers had to comply in the past. Hortgro which represents the deciduous fruit industry in SA, the SA Table Grape Industry and the Subtropical Fruit Growers which covers the likes of Avocado Pears, Litchies, Mangoes and Macadamia nuts and more. Whether you are eating breakfast or buying fresh fruit to snack on whilst travelling, you can be rest assured of great quality and a healthy holiday. Having lived all my life in the leafy Southern suburbs then in the City and Atlantic Seaboard municipalities of Cape Town throughout my whole life, I recently moved “lock, stock and barrel” across the Table Bay to Big Bay-Blouberg, quite the opposite side of the bay from the City and Harbour, than I was ever used to and before my arrival to my new habitable location, had firm opinions, mostly negative I may add, to the merits of living at the so-called windblown gate-way to the West coast. Having worked the Cape Town region as a tour guide for the past 10 years, I began to realise the general industry I work within and my previously preconceived personal ideas of the Blouberg side of the bay have great parallels and similarities. I have lived here now for 6 months and have realised a remarkable side of Cape Town which to me never existed. There are copycat scheduled day tours offered by the many tour companies, leaving daily from Cape Town to the firm favourites of Cape Point and to the Wine country, yet not a single one which explores the opposite, so called, “Forgotten” side of Cape Town. Given the unique floral kingdom which encompasses the majority of the Province, the Big Bay side and the country districts further up the West Coast do get a window of a high season to benefit from whilst the tapestry of colour from the wild flowers adorn these regions for a few weeks every year in Spring time. So given the fact these routes are largely neglected in the context of organised touring, if you have a private guide and vehicle at your disposal or are driving your own car rental I have a few ideas for you to explore and enjoy so make sure you send me an email and we can discuss some exciting options solely suited to your travel group dynamic. You can make a full day out and explore further a field or fit a nice little program of sight-seeing and fun into half a day too. A good plan for your tour party, if you have children even better, is after breakfast head around to Big Bay and let the family enjoy the beach at Eden on the Bay before it gets too hot and possibly book the family in for some fun surf lessons together. If Mum and Dad prefer, there are plenty of choices for a beachfront coffee, snack or depending on the time of the day, a good gin and tonic whilst in view of the beach and marvelling at the panoramic view of the majestic Table Mountain across Table Bay in the back ground whilst the children under surf instruction, enjoy the waves. Of course, Big Bay is also the Premium Kite surfing and Windsurfing off-shore sailing location in South Africa. One can choose between relaxing at a Cafe, taking in the extravaganza of colour from the movement of the performing kites whilst enjoying the spectacular Mountain backdrop across the bay or for the more adventurous there are many kite surfing schools to select from in the area to learn Kite surfing at a famous and very unique sailing destination. This of course would require you to stay in one of the many guesthouses which host sailing folk throughout the year, as it’s certainly not a one lesson and ‘off you go’ sport. Lunch time on this coastline is explorational. I can highly recommend driving about 15 minutes further up the coast to the beachfront town of Melkbosstrand. Usually not crowded with plenty of parking to be found and an amazing host of seaside restaurants with casual ambiance, great fare and a fantastic long beach to stretch the legs after lunch. Recommendable is the historical, Dam Huis restaurant, housed in the original 1790 homestead which has recently been extended and nicely renovated, my personal favourite Cafe Orca which has exactly one meat dish and everything else from the sea on the menu guaranteed to put a smile on your face and appreciation of great value and then a little secluded and very relaxing with hunger- busting food and unequalled proximity of the shoreline is the Kliphuis restaurant. To extend the day, travel up the coast to the West Coast National park, visit the town of Laangebaan or simply explore the local wine region known as the Darling wine route which offers fantastic opportunities to experience quality wines and a stroke of country mystique. So, if you are the kind of traveller who enjoys the highlights of a destination but has the time and appreciation of exploring the places locals enjoy and wish to spend your time and visit the off-beat, less commercialised and alternative places as local South Africans would, feel free to contact me at GPS SA to have an informal online chat. 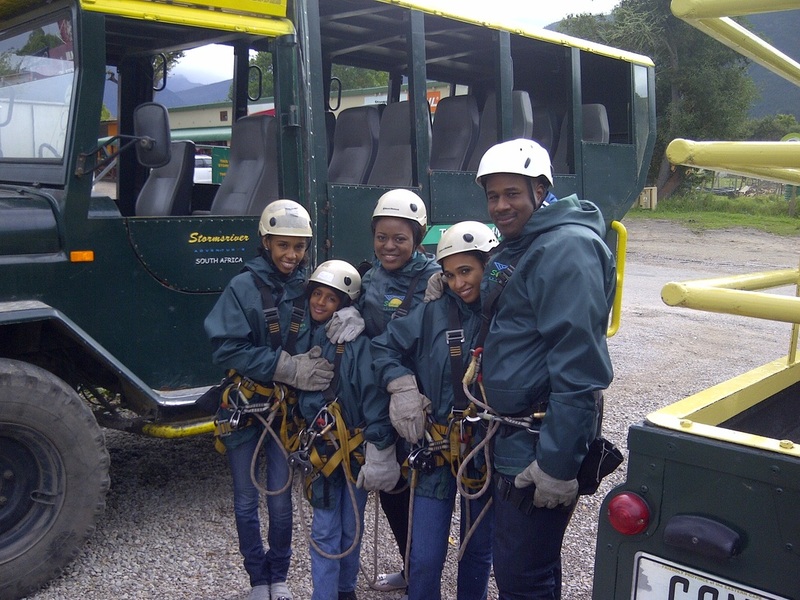 We can even suggest how to experience South Africa’s commercial tourist highlights in a manner not conveyed. At the end of the day it all boils down to your group dynamic, specific interests, logistics and what makes you tick. Before commiting to a tour package to South Africa, make sure the offering suits you and the needs and interests of your tour group..
South Africa is a new and very diverse country to visit for most nationalities. There are many tour packages on offer to tourists from around the world and from personal experience, they mostly follow similar routes and patterns. Of course, if it’s the first time you visit South Africa you will probably follow a highlights package on offer, as you would if travelling for the first time through Europe or visiting a city such as London. However, before you make your mind up for South Africa travel, do your homework carefully. Ask yourself questions such as what time of the year am I travelling in, it may well be summer back home but is the opposite in the Southern Hemisphere so although it is still nice to travel in South African winter season, the colourful pictures of sunshine and swimming in the sea or a pool on the brochure could be misconstrued also for the fact South Africa has all geographical conditions changing from Province to Province at the same time of the year. So a package which works well in good weather is often discounted and sold during winter but you simply won’t achieve the same satisfaction. However you can come to South Africa in winter and visit a region which although cooler than summer, still has good outdoor weather for activities. I always revert back to the fact that South Africa is a far bigger country than most people anticipate and packing too much into an itinerary can involve time consuming travel either by air or road. So ask yourself, do I want to see and do as much as possible in a 7 to 14 to 21 day period virtually packing your bag and moving on to a new hotel and destination every 2nd day and at the end feel like you have to go home for a holiday or do you select fewer places to visit and increase the days in each to maximise your time to explore and relax involving minimal bag packing and less travel time in a air-plane or coach. Whichever travel pace or style you may choose, make sure each place you visit has a meaning and an interest or appeal to you. There is nothing worse than signing up for a tour and excursions which don’t appeal to you. GPS Tours is a great place to start your planning for a South African holiday. GPS Tours enjoys success with travel groups and individuals by seeking out exactly what the group dynamics are and what the travellers’ interests are. GPS will study the South African calendar of events and compare the dates you wish to travel, for example you certainly don’t want to be planning a Cape Point tour on the day of the Cape Argus Cycle tour as this will severely disrupt your day out. GPS Tours is able to supply credible advice and firsthand knowledge of South Africa which will be extremely beneficial in your decision making and success of your African experience. Contact the Owner and author now via the contact page on this website and begin a friendly rapport whilst building a travel worthy South African itinerary. Enjoy Table Mountain but please take all hiking Precautions. Micro climates are experienced on all sides of the Cape Peninsula, from Cape Town to Cape Point, making the over used cliche of “Four seasons in one day”, seem more like a true statement. In Camps Bay the South Easter wind can sand blast people off the beach and a 5 min drive around the corner to Sea Point you would be hard pressed to believe there was any wind at all. You can drive past the University of Cape Town situated on the back slopes of Table Mountain in Rondebosch and on approaching the next suburb of Newlands where Kirstenbosch National Botanical gardens are located you sometimes need to apply your windscreen wipers, drive into the heart of Newlands and apply the faster speed to the windscreen wipers and as you exit the suburb and enter the neighbouring suburb of Bishopscourt you can switch off the windscreen wipers and be asking yourself where did that rain materialise from? I recall phoning a friend to confirm a game of golf, his retort was if I was mad as it was raining hard in Hout Bay and he was surprised when I said it was fantastic sunshine on the City side. My point being is, if these climatic conditions change so quickly on the ground then what can one experience 1067metres (3500ft) above sea level whilst walking or hiking on Table Mountain? Table Mountain recently received the accolade of being included as one of the new 7 Wonders of Nature in the world. It’s majestic, spell-bounding appeal and being located in the heart of the City makes for extremely easy access and offers some fantastic hiking and climbing. The perils I would like to express, start with the complacency people tend to have thinking Table Mountain is void of any dangers as it’s in the City. Countless times I can personally recall people looking more prepared for the trip up the mountain in the Cable Car than hiking a mountain, dressed as though they plan to go to the beach afterwards only to find out their intentions were to hike up the mountain! This is where it all starts to unravel badly, before the amateur hiker has even started out. People with the best intentions often are so ill-prepared not taking Table Mountain as seriously as a mountain hike in a wilderness area. I have personally seen people starting out in T-shirt, shorts, running shoes or less and a 250ml bottle of water. This I’m afraid is a disaster waiting to happen. The arrogance and looks of disgust I get from both tourist and local’s, when I say to them their water will be finished before they reach the start of the trail astounds me. There are fatalities every year on Table Mountain and many rescues to boot. To highlight two of the main causes of rescue are a lack of water and changes in conditions. Platteklip Gorge is one of the commonly used trails up the mountain however with its East facing angle receiving full morning son in summer months where temperatures can reach over 30deg C and with the heat reflecting off the bare rock, temperatures can soar up to 10 degrees higher whilst in the gorge. With insufficient water being carried and few mountain streams running in the summer this can result in de-hydration and unnecessary critical situations so if you intend using the mountain take a minimum of 2litres of water per person and a good hat and plenty sunscreen. Talking to an experienced veteran of the mountain, Brian Georgeson, a man who regularly leads Hiking publication journalists and personally helps to up-date Mike Lundy’s popular guide to mountain trails in The Cape says,” its annoying to see people not taking necessary precautions, the amount of times I have had to give parched hikers extra water, not only for themselves but they never think of their beloved dogs either”. The other scenario which can play out and catch a hiker totally off guard even with being thoroughly prepared, is the change in the weather conditions. Cape Town has the cold Benguela current coming directly up from the cold Antarctic and southern Atlantic, together with soaring land and air temperatures in the summer can produce what is referred to as mini-coastal low pressures which on the clearest days can result in a thick blanketing fog which sprawls in and engulfs the mountain. Temperatures can suddenly drop and visibility decreases to virtually zero. So it’s essential to be prepared with warm clothing to counter wind and damp, emergency rations, a mobile phone and always inform somebody responsible on the ground of where you intend to hike and what time you are expected back. It’s important not to deviate off this course and it’s even more important to stay in one position if you are disorientated and have no clue in which direction to move in. If you take the necessary precautions the Mountain Club of South Africa under the auspices of the WSAR (Wilderness Search and Rescue) teams will be in a better position to help you. Planning for a hike up Table Mountain is not only essential but will help you enjoy this natural wonder better and safely. There are good books and guides to be found in all book shops or even better for your first accent of the mountain, it is a good idea to join a professional guide to lead and educate you. Summer energy is approaching Cape Town. The Summer South Easter winds have contributed to flooding rains in other parts of South Africa and with businesses around the country closing by week's end, Cape Town is sure to start getting busy with up country people coming to enjoy the beaches and the lifestyle unequaled anywhere globally. If you sitting in the Northern Hemisphere, expecting the big freeze to hit and this photo of Camps Bay beach seems appealing, then think about visiting South Africa in the New year. You will have no regrets in making that decision for 2013. Cheers for now, I'm off to get some fresh-air, sun and play some golf. Knysna Heads walk and have a picnic for lunch. Eating whilst in South Africa, especially Cape Town and the Garden Route is great value for money especially in terms of quality and quantity and you don’t necessarily have to go to lavish restaurants and spend tremendous amounts of money to fill your stomach and feel content. In fact there are a couple of ways to get a decent meal especially for lunch without having to sit down in a restaurant at all. Two great meals and favorite to many locals and found in many food selling shops in most areas in Cape Town and many other places around South Africa is either Calamari or rotisserie roasted chicken. Besides an abundance of fast food outlets such as McDonald's, KFC and South Africa’s own Steers and Nando’s, there are many easier ,cheaper and for that matter healthier and happier ways of picking up lunch or a snack on the run when traveling. Rotisserie Chicken is a big seller. You can buy a whole chicken to share or get pieces to go as a portion from a reasonable R20.00 to around R55.00 for the whole bird. You will be able to find quality chicken in this fashion from places such as Pick ‘n Pay, Spar to Filling station services food outlets. It isn’t fried chicken and combined with an already made salad or a couple of fresh bread roll’s and you have a cheap healthy lunch and you won’t waste an hour sitting inside a restaurant either. A firm favorite which is possibly a little unhealthier compared to rotisserie roast chicken is of course South Africa’s great Calamari or squid. Totally unexpected shops such as Pick n Pay which has the largest supermarket chain countrywide has decent fried Calamari in their deli section on sale to go. For as little as R15.00 you can fill up on Calamari with great ease. Cape Town and along the coastal regions have an abundance of Fish ‘n Chips shops. Sometimes there is nothing better to get a fillet of Hake, sit on a beach or a bench and eat while watching the ocean. On one occasion on a tour, I had been driving and guiding a couple from Alberta, Canada. They had been constantly eating in restaurants since they had left home over a week prior and on arriving at lunch time in Knysna, a resort town on the Garden Route, I suggested visiting my favorite fish ‘n Chip outlet in the town, to pick up some calamari, fish and chips and go down to the famous Knysna Head’s, a picturesque headland location at the mouth of the lagoon entering the ocean to eat lunch. Whilst waiting for the food, they popped next door to the wine shop and believe me, the meal or picnic they had that day was probably the most memorable on their holiday.